All I had to do was to read and reread the page in In search of lost time in the volume in The Prisoner where Proust reports the circumstances surrounding the death of Bergotte. I will finally see, I will fixate just as he did, on this little section of yellow wall. 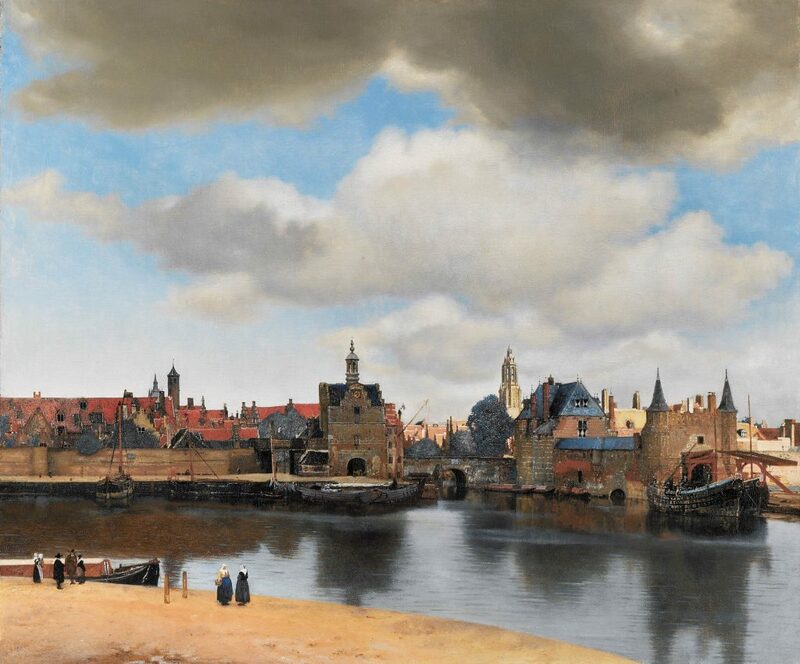 I had to read the words again standing in front of Vermeer’s View of Delft: « … a fairly mild attack of uraemia had led to his being ordered to rest. But, an art critic having written somewhere that in Vermeer’s View of Delft (lent by the Gallery at the The Hague for an exhibition of Dutch painting), a picture which he adored and imagined that he knew by heart, a little patch of yellow wall (which he could not remember) was so well painted that it was, if one looked at it by itself, like some priceless specimen of Chinese art, with a beauty that was sufficient within itself… », Bergotte walked past several pictures. « At last he came to the Vermeer which he remembered as more striking, more different from anything else he knew but in which, thanks to the critic’s article, he noticed for the first time some small figures in blue, that the sand was pink, and finally, the precious substance of the tiny patch of yellow wall. His dizziness increased, he fastened his eyes like a child to a yellow butterfly he wants to seize, to the precious little section of wall, “ That’s the way I should have written, » he said. My last few books are too dry, I should have added several layers of colour, make my sentence precious within itself, like this little piece of yellow wall.” Meanwhile he was not unaware of the gravity of his condition. In a celestial scale that appeared to him, his life filled one of the trays and the beautifully painted yellow wall was in the other. He felt that he had rashly sacrificed the former for the latter. . “All the same,” he said to himself, “I shouldn’t like to be the headline news of this exhibition for the evening papers.” He repeated to himself: “Little patch of yellow wall with a sloping roof, little patch of yellow wall.” » And Bergotte collapsed. He was dead. Strangely, and probably because I had never done it before, I reread the page written by Proust in front of Vermeer’s painting and I noticed that if Bergotte had spotted « for the first time the little figures in blue », it was because the art critic had convinced him that they were « blue ». But amongst the seven figures along the Schie Canal, only one woman is wearing a blue apron. The dress of the mother on the left holding her baby in her arms is black. Two men and a woman talking next to her are dressed in black and brown. Finally, the dress of the woman opposite the woman with the blue apron is dark grey. How can we not conclude that Bergotte had seen, or believed that he had seen, what the art critic had said he had seen, those « little figures in blue », because he did not question the sharpness of the critic’s gaze. There is no blue apart from the hull on the boat on the right and the roof slates at the Gate of Rotterdam. Below the rooftops, to the right of the bell tower of Nieuwekerk, there is another roof, broken up by a sitting dog, highlighted by a triangular shaped shadow. It is yellow. Pale yellow. This roof is different to all those on the left with their red tiles. But a scrupulous description could not mistake a wall with a roof. It is on the extreme right of the canvas, above the slanting beams of a double drawbridge whose opening allows barges to go from one canal to another that we see the rectangular shape of a wall. Pale ochre. Not yellow. What’s more, if this wall is (almost) yellow, it has no canopy. Whereas what Bergotte saw was « a section of yellow wall with an awning ». There is little chance that this (almost) yellow wall is the one seen by Bergotte. The art critic he read about convinced him to disregard the advice given to him to rest in bed due his uraemia attack and to go to an exhibition because it was « so well painted that it was if you looked at it alone like a precious chinese work of art, and of a beauty that suffices within itself.” How can this rectangle without an awning be comparable to « a precious work of Chinese art »? Can we spot « a beauty that suffices within itself » here? Doubt wins over. Doubt prevails. Conclusion. Bergotte collapses and dies in front of Vermeer’s View of Delft and was murdered by an art critic’s lie. Still, if the latter is guilty, guilty without doubt, we must grant him mitigating circumstances. Because, without the lie about the « little figures in blue », without pointing out the « little patch of yellow wall », Bergotte would not have scoured the canvas to the same extent. Because without the lies being reported by Marcel Proust, I would not have lo-ok-ed as I should have done. Second conclusion. Hypocrital and perhaps cynical, it can only beg a question. Must the description of a painting be allowed to lie so that the gaze is what it should be, meticulous?